And another vector. I did a few while I didn't have internet and am just uploading them now. This vector was taken from S2E14: The Last Roundup. Added a hat for the purposes of the poster I'm helping with. EDIT: Fixed a couple minor stroke issues. I used it here. Thanks. Used and credited. Thanks for making it! Thanks for using it! Great work! 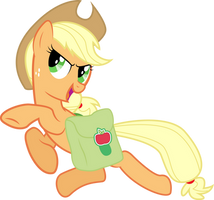 Applejack looks cute in that pose!